Maruti Suzuki launched the all-new Ertiga in India last year in November and the MPV has been a hit among buyers in the country. The latest reports emerging on the internet indicate a growing waiting period for the recently launched MPV. According to a report on GaadiWaadi, the new Maruti Ertiga now has a waiting period of up to 24 weeks depending on the variant. The new Ertiga is based on an all-new HEARTECT platform which makes it lighter, larger and stronger than the previous generation. Other cars that use HEARTECT platform are Maruti Swift, Ignis, Dzire and Baleno. The MPV is now larger in size and has grown in length by 99mm and has become wider by 5mm. The wheelbase remains the same at 2,740mm but the cabin space has increased and so has the boot space. Ertiga remains 7-seater as before albeit the last row gets ample space too now. All-new Ertiga does not face a direct competition in the segment. 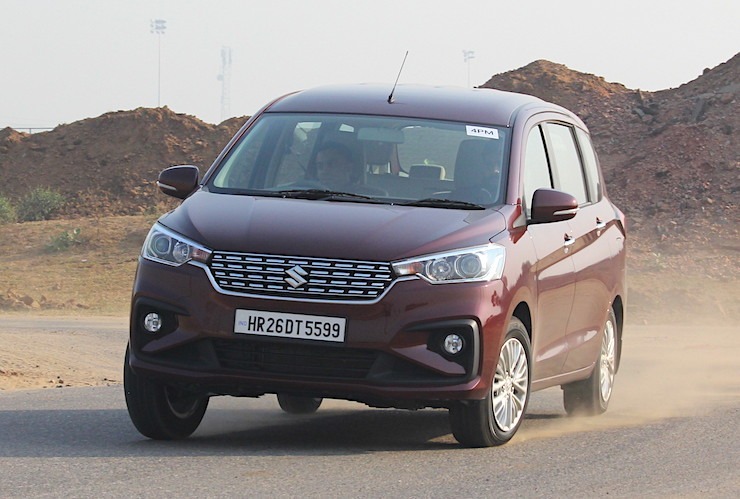 The closest rival in the segment is Mahindra’s Marazzo MPV, but it is approximately Rs 2.5 lakhs expensive than the Ertiga. What could possibly become a competition for the Ertiga is the upcoming RBC MPV on which Renault is currently working. It has been spotted testing on Indian roads a couple of times. The all-new Ertiga is powered by the all-new 1.5-litre petrol engine that also powers the all-new Ciaz. The diesel engine is the same 1.3-litre multijet diesel engine sourced from Fiat. Maruti has also developed an all-new 1.5L diesel engine in-house which is likely to be offered in Ertiga soon. The MPV also gets SHVS mild hybrid system which further aids in fuel efficiency. The petrol engine produces a maximum power of 104 Bhp and 138 Nm torque. The diesel unit produces 89 Bhp and 200 Nm of peak torque. A 5-speed manual transmission is available with both the engine options. A 4-speed torque converter automatic transmission is available only with the petrol engine. Prices for the new Maruti Suzuki Ertiga start at Rs. 7.44 lakh for the base LXi varinat and go all the way upto Rs. 10.90 lakh for the top of the line ZDi+ variant. All the prices mentioned above are ex-showroom, Delhi. Soon, Maruti will introduce a more powerful diesel engine on the Ertiga. The engine in question will be a 1.5 liter, turbocharged unit developed in-house by Suzuki. The motor will make 94 Bhp-225 Nm, and will be called the DDiS 225. A new, 6 speed manual gearbox will accompany this engine.